On 15 April 2011 the history group held a ceremony to mark the location of two particular graves at the cemetery. Chudleigh History Group renovates grave of a Polish soldier. 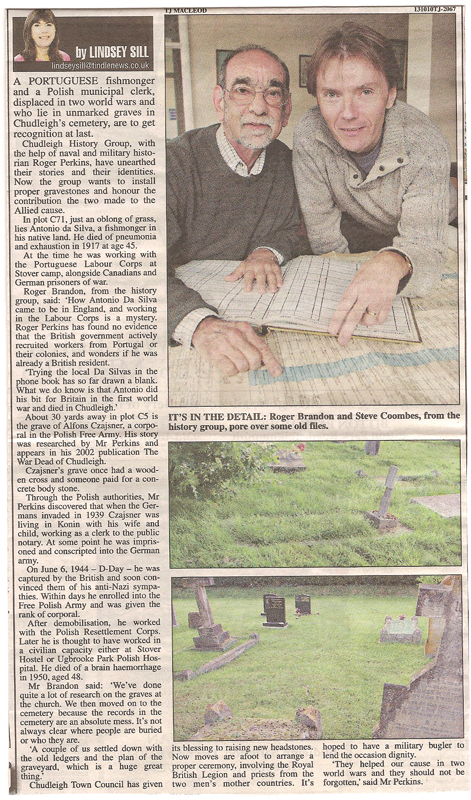 CHUDLEIGH History Group plans to renovate the grave of a Polish corporal in the Free Polish Army who is buried at Chudleigh Cemetery. Alfons Czajsner was born in May 1902 in Konin. When Poland fell to the Germans in 1939 Alfons was married with a family and working as a clerk in the Municipal Offices. Within two months, 56 of the town's leading men were arrested and shot, but Alfons continued to work in the Notary Public's office as part of the Judenrat and must have been involved (willingly or not) in the compilation of names and addresses of Jews for deportation, and the re-assignment of their houses. For reasons that we don't know Alfons fell foul of the Germans and was arrested and imprisoned in June 1942. By mid-1943 the Germans were desperate for man-power and Alfons was released in September and then conscripted into the German Army. After training he was posted to coastal defence in Normandy. He was captured on D-Day, 6 June 1944, and brought to England. He was absolved from having any Nazi sympathies and allowed to voluntarily enrol in the Free Polish Army as a corporal. After demob in September 1946 Alfons joined the Polish Resettlement Corps on a one-year contract, based at Ugbrooke Park in Chudleigh. Having worn a German uniform and been in the Free Polish Army return to Communist Poland was out of the question. It is not clear what he did after that year but it is likely that he continued to work at Ugbrooke or Stover Hostel until 1950. On December 29 of that year he died of a brain haemorrhage at the Polish Home at Ugbrooke. The funeral was performed by Revd Andrzej Glazewski, who had been a Captain in the Free Polish Army and fought in Normandy. It is not known whether Alfons family survived, but the evidence suggests not. His mother, however, did. She ended up in Communist East Germany at the end of the war. In 1950 she sent a letter to England seeking any information about the fate of her son. She was informed that he had died 10 months earlier. The Polish Resettlement Corps was disbanded in September 1949, but someone paid for a concrete plinth and a wooden cross for his grave at plot C5 in Chudleigh cemetery. The cross is now in a sorry state and there is no evidence of a marker with his name. Chudleigh History Group plans to have a cross made (approx 3ft high) and mount a plaque on the cross pieces. The group intends to mark the occasion with a ceremony that will include a Polish Priest, the British Legion, and a bugler as well as local interested parties. The date for the occasion is set for 15 April 2011. The 15th April 2011 turned out to be a fine and sunny day for the ceremony. At 11:30 Rev Wimsett held a service at the parish church and from there the party removed to the cemetery for the dedication of the two crosses. Among those present was the chairman of the Worldwide Frederation of the Free Polish Ex-combatants and a Royal British Legion bugler who sounded the Last Post at the graveside. The History Group was represented by the chairman Mr Alan Brunton.